Dutch electrical firm Werkina, Lloyd’s Register, Asto Shipyard and inland barge operator Port-Liner are working on Europe’s first electrically powered inland container vessel. The first five small ships in the series will be completed this year, and six larger vessels are in the works. 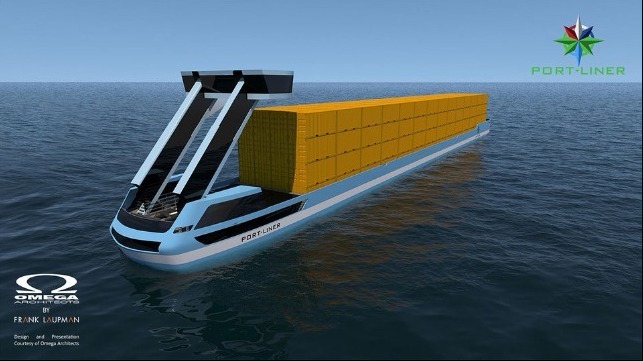 The novel barges will use containerized battery packs for power, which can either be recharged or exchanged at the terminal, allowing for rapid turn times. The smaller barge will carry 24 TEU and use one battery pack, and the larger model will carry 224 TEU with four battery packs. Werkina says that the larger models will carry about eight percent more cargo than standard barges, as they will not need as much space for an engine room. They will also have features that prepare them for unmanned operation. Like many barge designs, the vessel will have a retractable wheelhouse that can be lowered to pass under bridges. Unlike standard models, though, this wheelhouse will be supported by two arms on each side, which also serve as enclosed access passageways. The European Commission’s Connecting Europe Facility provided an $8.5 million grant to support the project, which is intended to spearhead the use of electrical power in inland waterway navigation. The Port of Antwerp has provided an additional $250,000. Port-Liner CEO Ton van Meegen told the Loadstar that the containerized battery packs could allow the electricification of Europe’s existing, diesel-powered inland fleet as well. “There are some 7,300 inland vessels across Europe and more than 5,000 of those are owned by entrepreneurs in Belgium and the Netherlands. We can build upwards of 500 a year, but at that rate it would take some 50 years to get the industry operating on green energy,” he said.